Built on a rocky bluff above world-famous Condesa Beach, the hotel's main attraction is its pool and sundeck. A staircase leads guests down to the golden beach, with lounge chairs, palapas and a variety of water sports to keep you entertained. The rooms were recently renovated, giving a thoroughly modern slant to the still-tropical ambiance. 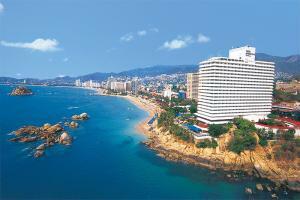 On the most vibrant and popular beach, Condesa, 10 minutes from downtown, 40 minutes from the airport. Restaurant Chula Vista - featuring seafood and international and Mexican cuisine. Snack Bar - either near the beach or pool area. Chula Vista Pool Bar - Adjacent to the main restaurant, and featuring drinks in and around the pool. Cliff Diving, Golf, Puerto Márquez, Soledad Cathedral, San Diego Fortress, Papagayo Park, Shopping.